This Teenage Mutant Ninja Turtles Cake and Cupcakes were the hit of my son’s 6th birthday party and the best thing about it is they are SIMPLE to make! My son is a HUGE Teenage Mutant Ninja Turtles Fan so when he had the chance to choose his birthday theme, it was natural for him to choose his favorite Turtles. 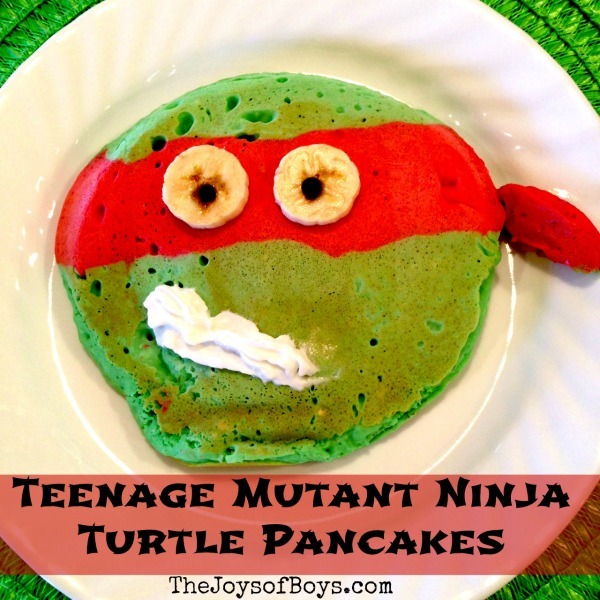 He started off the day with these super fun and really popular Teenage Mutant Ninja Turtles Pancakes and the rest of the day was full of the coolest turtle decorations (post coming soon) and this fun Teenage Mutant Ninja Turtles Cake and Cupcakes. Now, I normally would show you step-by-step pictures of how I made this fun cake but…my super naughty toddler got a hold of my phone and deleted all of my pictures. This is the only one that survived. Boo! So…I will describe it the best I can and please leave a comment or email me if you have questions. 🙂 #ToddlerTroubles! Fill the round cake pan a little more than half way full. Use the remaining batter to divide into the cupcake pan. Bake according to the package or until a toothpick comes out clean. Typically this takes around 25 minutes. Once warm, turn cake out on to a cooling rack and let cool completely. Mix a few drops of green food coloring into your frosting. 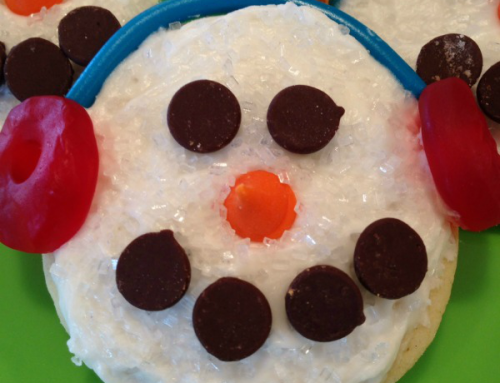 Frost the cake and cupcakes. Using a sharp knife or kitchen scissors, cut one large strip and several small strips of the Wilton Sugar Sheets. You can decide which Ninja Turtles you want to make and use the appropriate color. Make sure to ask your kids because they WILL know if you get it wrong! 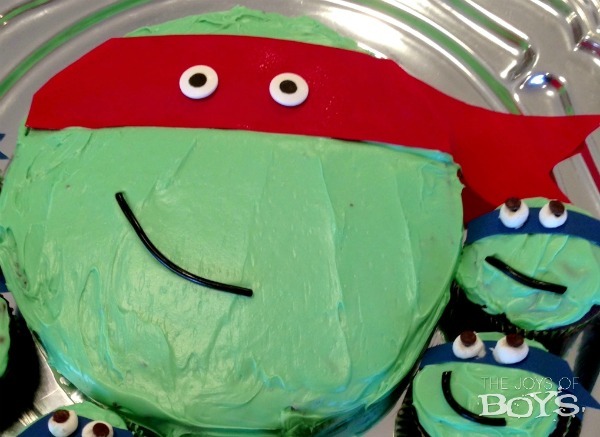 For the Teenage Mutant Ninja Turtles cake, add the strip of sugar sheet and use a dab of frosting to add the eyes. I also cut a small strip of the sugar sheet for the ends of the bandana and cut a “V” in the ends and laid it at an angle. Then use a small string of black licorice for the mouth and you are done with the cake. For the Cupcakes, add the cut up sugar strips for the bandanas. Then, cut some mini-marshmallows in half and use a dab of frosting to add them to the cupcakes. Then add the mini-chocolate chips for the insides. You can use mini candy eyes, but I didn’t have any and living where I do makes it difficult to find anything fun like that. But they would make these even easier! And there you have it! 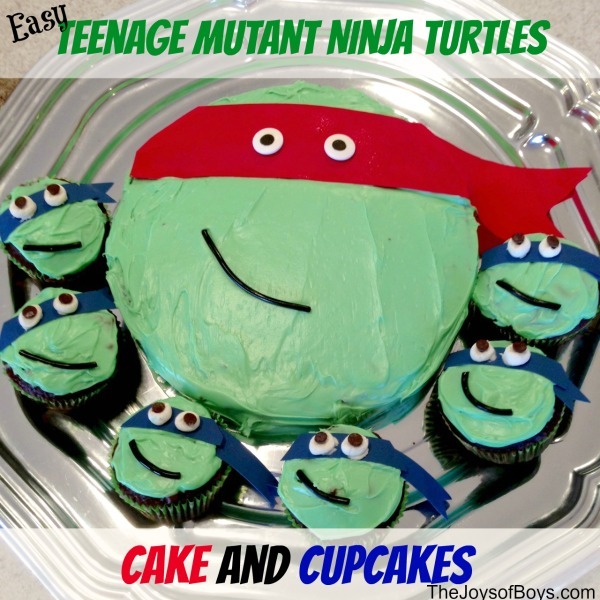 And Easy Teenage Mutant Ninja Turtles Cake and Cupcakes that any mom can make. Check back soon for our Teenage Mutant Ninja Turtles party decorations. This is really great! Perfect for my ninja turtle obsessed household. Thank you. My kids will love this! Thank you for sharing these great TMNT fun food tips! 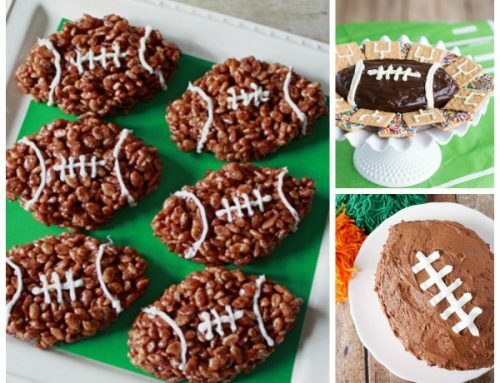 Our little ones would have so much fun with this cake! Thanks so much for sharing your awesome recipe with Full Plate Thursday this week. Have a great weekend and come back real soon! Love this idea! Love TMNT! The cake and cupcakes look great! Stopping in from the G’Day link party. I love that cake! Pinning it to my kids party board! I have not worked with the sugar sheets. How do you color them? 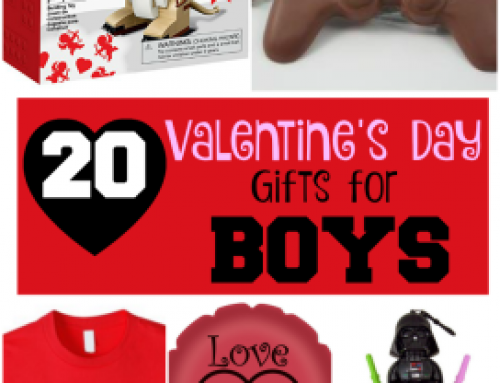 This looks easy, and I am sure my grandson will love it. Thank you. Yes they come pre-colored and then you just cut them out. Super easy!